The map interface we've created for Find-A-Record is cool, but it's not simple enough for our target audience. 1. The collections being returned are not ordered. We should be able to tell the user which collections they should search first, with priority given to collections that are easy to access and most likely to contain the info the user wants. 2. When doing genealogy, our target audience thinks in terms of people, not places. They are thinking, "I want a record for my great-grandmother." But our map interface expects them to be thinking, "I want a record for my great-grandmother who was born in Adliswil, Switzerland between 1813 and 1816 and most likely attended a church within 5 kilometers of that village." We can solve both of those problems. When a person is browsing their family tree and thinks, "I want to find a record for my great-grandmother", they should be able to just click a button and get results from Find-A-Record. The profile for their great-grandmother contains place information and dates. We can process that information and generate the necessary query without having to ask the user anything other than "What ancestor do you want to find records for?" 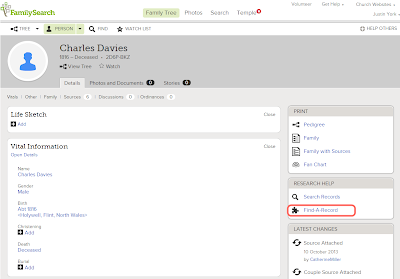 Above is the profile of Charlies Davies in the FamilySearch Family Tree. This has all of the information we need to generate a query. On the right, in the "Research Help" box there is a "Find-A-Record" link. When the user clicks that link it takes them straight to Find-A-Record and initiates a search. The results are an ordered list of collections. They represent the best method we could calculate for finding the records you want. 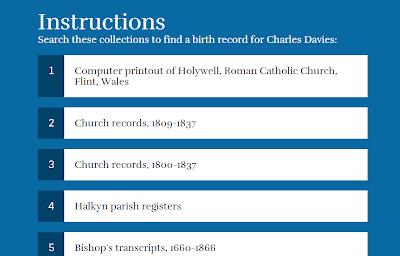 Clicking on a collection reveals instructions about the different ways of accessing it. The integration with the FamilySearch Family Tree is done with a Chrome Extension. We will eventually add integration for many more online family trees such as Ancestry.com, MyHeritage, WikiTree, and WeRelate. Integration with popular PC programs would be much more difficult and therefore isn't really on our radar yet. We will keep the map interface as an advanced view. We can't throw it away; it's too fun to play with. Will the Chrome extension be looking for Person microdata (scheme.org)? That's a good idea. We'll keep it in the backlog. Any idea if it's been "finished" yet? Every time I hear about it from the Google guys they say, "We're almost there". I've been in contact with the Google guys too. They depend on the schema.org organisation to incorporate the Historical Data microdata scheme. I have implemented the microdata markup on Genealogie Online and do see in Google Webmaster tools that the Google spider recognizes and indexes the Person and HIstorical Data microdata. But if Google Search is using it.... (that too is out of control of the aforementioned Google guys :-). There's the People Inspector, this plugin could be the basis for your development as it parses the microdata to do search search on several American sites. Thanks for the update. That's very good to know. What did WieWasWie do to block your extension? I can't imagine a way a website could do that other than changing their HTML structure or something similar that would break it. Basically they look for the injected HTML and remove it, see source. Wow, that's ridiculous. I can't believe they did that.